The NCAA announced this morning that North Carolina’s hastily passed HB 142 law “minimally” met the league’s standards for consideration in awarding championship events. HB 142 reflects the most objectionable sentiments of HB 2, including anti-transgender discrimination and a ban on municipalities passing their own policies to protect LGBT people for the foreseeable future. A number of the nation’s leading LGBT and civil rights groups, as well as businesses, continue to oppose the new law because it allows discrimination to continue unchecked in North Carolina. “It’s unfortunate that the NCAA views this new law in North Carolina as minimally acceptable – for the LGBT people, and particularly the transgender people, who will continue to be treated as second-class citizens under state law, there’s nothing minimally acceptable about this situation. 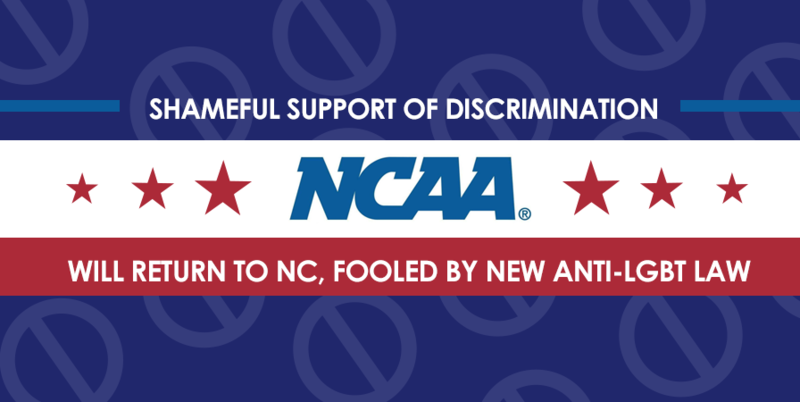 We respect the lead role the NCAA has played in drawing attention to HB 2 over the last year, and the commitment to nondiscrimination they cite in their statement today. But unfortunately, the NCAA made the wrong call today.